The votes are in and the nominees have been announced for the 65th annual Primetime Emmy Awards, with the ceremony to be held on September 22, 2013. Now it's time for all the nominated shows and their respective stars to start campaigning to encourage the most votes from eligible academy members. 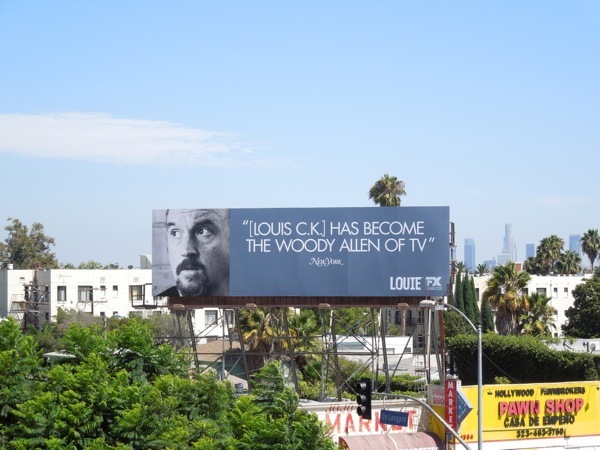 Following on from the 2013's Emmy Consideration ad campaigns, the first wave of Emmy Nomination billboards have started to appear in the skies of L.A. Even though FX's fantastic 80's-based Cold War sleeper agent drama, The Americans, was shamelessly snubbed this year, two of the cable channel's shows earned high praise indeed and have been recognised under a 'FX Fearless' ad campaign. 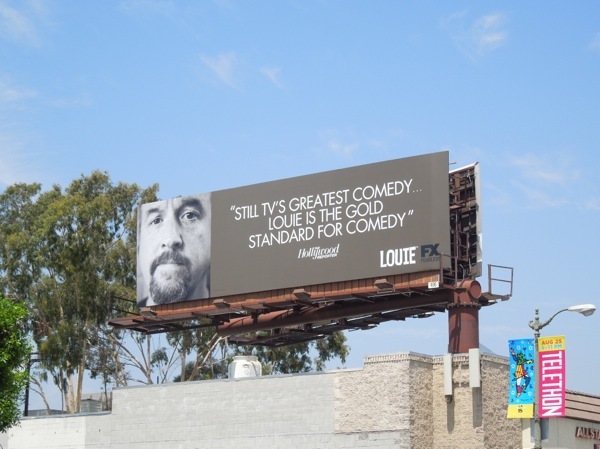 Apparently Louie is first basic cable show to ever receive an Emmy nomination for Outstanding Comedy Series, congratulations and multiple billboards are obviously in order. Louis C.K. stars as a fictionalised version of himself in the series, playing a stand-up comedian and newly divorced father of two daughters in New York City. Among many awards for the series, last year Louis C.K. won the Emmy for Outstanding Writing for a Comedy series for the episode 'Pregnant'. This year in addition to Outstanding Comedy Series, the show is up for five other Emmys, including Lead Actor, Guest Actress (Melissa Leo), Directing, Writing and Single-camera Picture Editing. 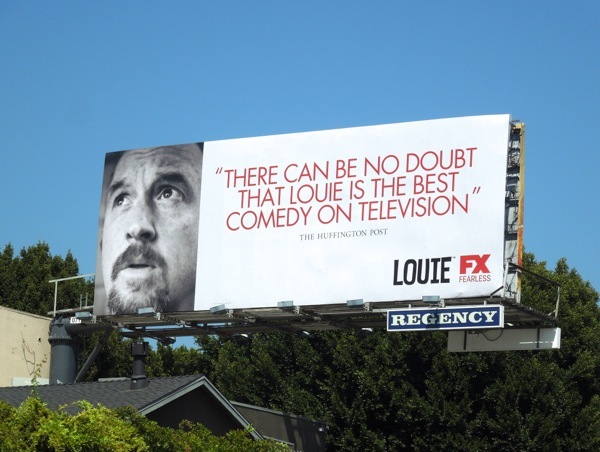 The Emmy campaign for Louie features accolades from press critics at The Huffington Post, The Hollywood Reporter, The New York Times, with New York magazine even heralding the comedian as the Woody Allen of television - it's a veritable Louie lovefest. The billboards were spied along Sunset Boulevard, Melrose Avenue, La Cienega Boulevard and Vine Street in the first week of August 2013. If you're a fan of the stand-up comedian, be sure to also check out this giant Louis C.K. HBO comedy special billboard. Meanwhile the sophomore season of FX's original horror fantasy, American Horror Story: Asylum, took on aliens, serial killers and evil spirits to garner a whopping seventeen Emmy Nominations to lead the field this year. Jessica Lange is nominated for Outstanding Lead Actress in a Mini-series or Movie for her portrayal of 'Sister Jude Martin', whilst she's joined by Zachary Quinto and James Cromwell for Outstanding Supporting Actor, with Sarah Paulson also deservedly recognized for Outstanding Supporting Actress. It's understandable why they chose Jessica Lange in her nun's habit to lead the Emmy campaign for the series as it's such evocative imagery. 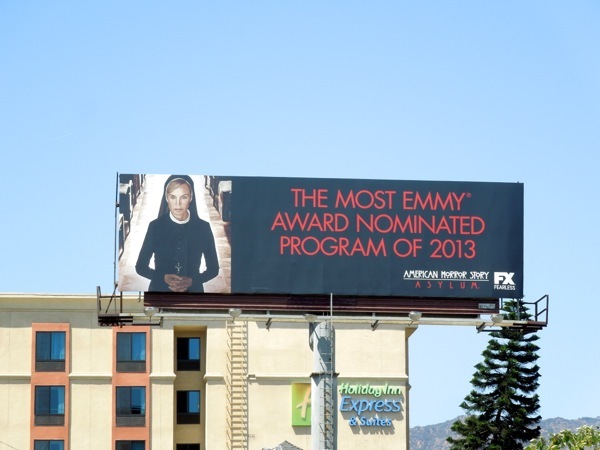 These Emmy billboards were spied along Sunset Boulevard and Highland Avenue on August 7, 2013. Plus if you like this, be sure to check out these other creepy billboards for American Horror Story: Asylum from around the streets of Los Angeles in October 2012. The horror drama is also up for Outstanding Mini-series up against polar opposites like History's The Bible, plus HBO's magnificent Behind the Candelabra 'Liberace' biopic and their Phil Spector biopic, USA's short-lived Political Animals and the Sundance Channel's Top of the Lake. 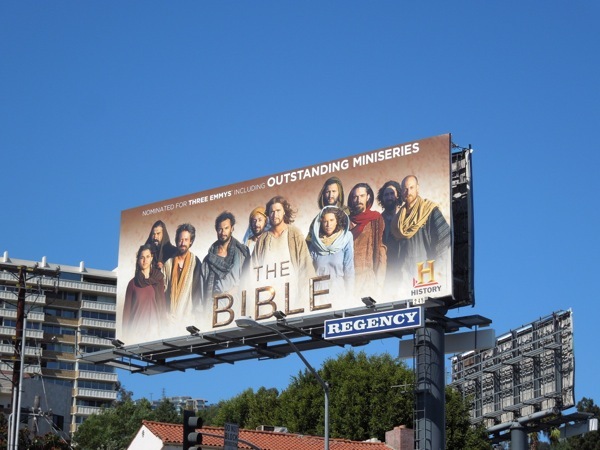 And finally History is supporting its Emmy Nominated series, The Bible, with this historical ad creative spied along Sunset Boulevard on August 8, 2013. 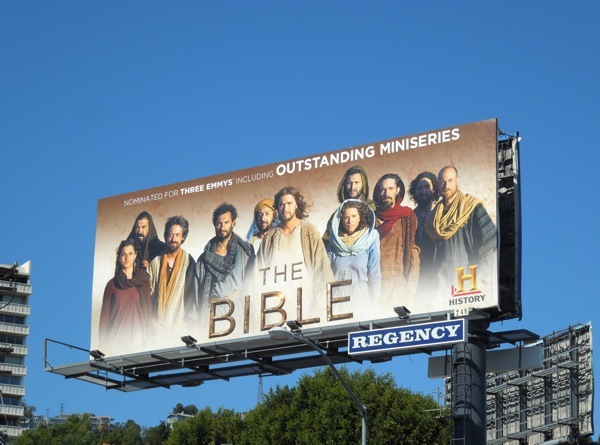 The 10-part mini-series brings the sacred Christian Scriptures to life with live-action and computer-generated effects, from Genesis to Revelation and covers such significant tales as Noah's journey on the ark, the Exodus and the life of Jesus Christ. 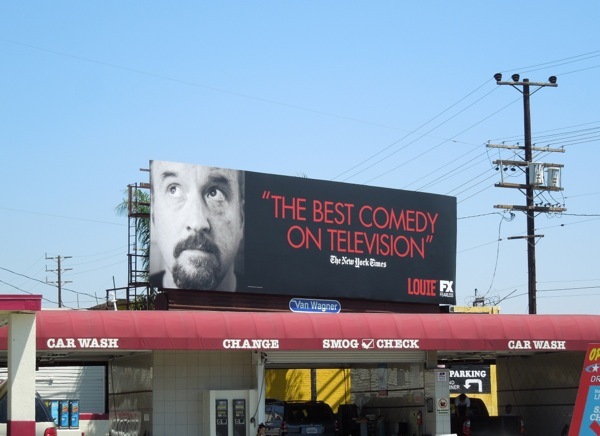 As you can see there's an eclectic assortment of Emmy billboards lining the skies, dominated by Louie at the moment, but Daily Billboard is sure more will follow. UPDATED: If you can believe here's another creative in support of Louie. 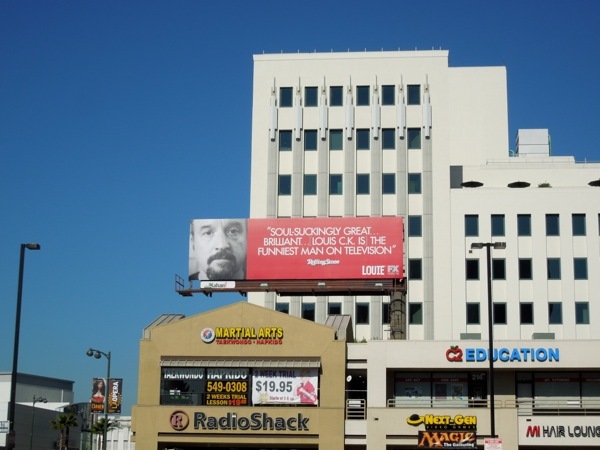 This red one quoting Rolling Stone, claiming he's the funniest man on TV, was spied at the corner of Wilshire Boulevard and Highland Avenue on August 23, 2013. Are you convinced yet? UPDATED: Louis C.K. 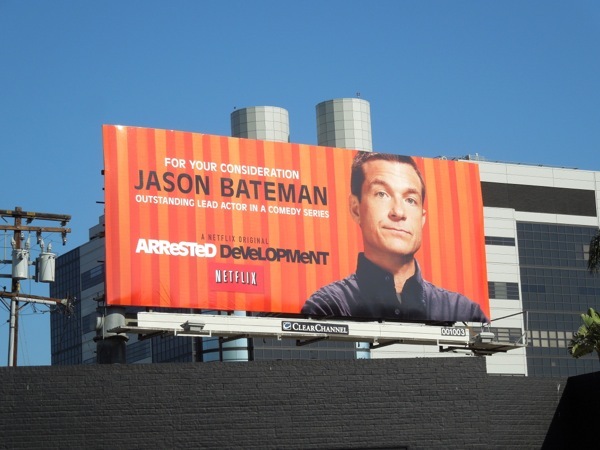 may have a boatload of billboards to help garner some votes, but fellow nominee for Outstanding Lead Actor in a Comedy Series, Jason Bateman, wants some of the action too for his starring role in Arrested Development's fourth season on NetFlix. 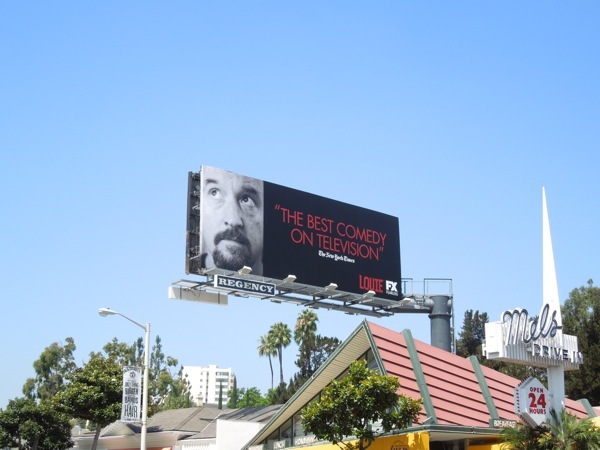 This Emmy nomination billboard for the actor's portrayal as 'Michael Bluth' was spotted at Robertson and Beverly Boulevards on September 18, 2013 (just in time for the awards ceremony on Sunday 22, 2013).